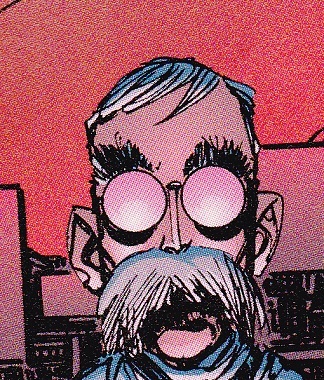 Roger “Specs” Byrne is a scientist along with Joe Miller who worked for Cyberface. When Dragon “died” in Cyperface’s fire pit they discuss if Dragon is truly dead with Roger not believing him dead. When Dragon once again “died” via Cyberface’s spacecrafts the pair once again discuss if Dragon is truly dead, this time both agreeing that there was no way he could have escaped death. Roger is not seen for many years after this, until Wily Williams Willard hires him to find info on Malcolm’s laptop. However, Roger tells him that there is nothing on the laptop.